During the hustle and bustle of the holiday season, one of my favorite ways to unwind at home is in a relaxing spa bath. 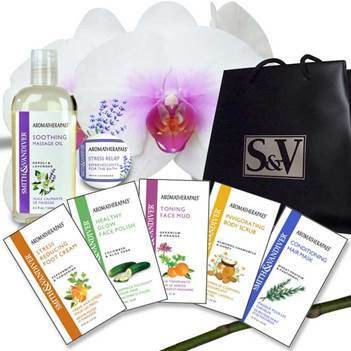 Smith & Vandiver Aromatherapaes® offers a wide selection of bath, body and skincare products. What I like most about Smith & Vandiver Aromatherapaes® is that this company uses only the highest quality ingredients and many of the products feature naturally derived ingredients and essential oils. I appreciate that I don’t have to worry about harsh, irritating chemical ingredients when I am using the bath and body products from Smith & Vandiver Aromatherapaes® which is the ultimate luxurious home spa experience! Smith & Vandiver Aromatherapaes® would make great gift ideas for the holidays. I also love the idea of making up pretty gift bags to give as a creative hostess gifts when heading out to all of those holiday parties. The Holiday Cupcakes Moisturizing Bath Fizzy in choice of red or green (SRP $7.99) looks good enough to eat and yet is actually a bath fizz! I fill the bathtub with warm water and drop in my bath fizzy cupcake. It immediately starts to fizz up in the water but what makes this really unique is that the frosting is actually a whipped floating bar of soap! The fragrance is intoxicating and the bar is very moisturizing as it has coconut oil in it. 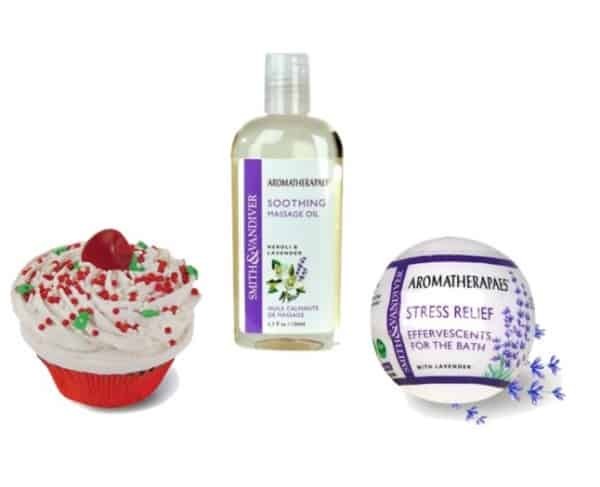 Another great stocking stuffer idea is the Smith & Vandiver Aromatherapaes® Stress Relief Effervescents For The Bath (SRP $2.79) which turns your bath into a relaxing spa experience. The natural lavender scent was amazing and I almost drifted off to sleep while enjoying a hot bath after one especially stressful day. Another wonderful way to unwind is the Soothing Massage Oil (SRP $7.99) which is 100% certified natural and features a blend of Sunflower, Safflower and Sweet Almond oils. These are perfect for extremely dry skin and of course for massages. I really like that this massage oil is clear and non-staining and smells wonderfully like fresh lavender……just divine! There are so many additional gift ideas that you are invited to visit Smith & Vandiver Aromatherapaes® to browse the entire selection. A few products that I have put onto my holiday wish list include the Sugar Plum Sparkle Body Lotion, the festive Sugar Plum Soap Globe and the Petite Treats Shimmer Collection. Which product from Smith & Vandiver would you most like to give or receive this holiday season? You are also cordially invited to attend the Smith & Vandiver Virtual Christmas Party event on Facebook being held from 9 a.m. to 5 p.m. PST on December 12th, 2013. 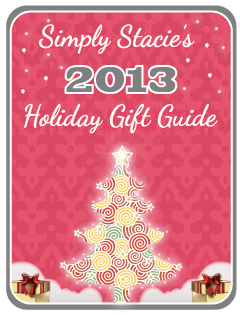 You can enter to win some fabulous door prizes! I would love to try the Petite Treats Shimmer Collection – Nectarina. I’d like to try the Island Fruits Moisture Fizz. i would like to try the Island Fruits Moisture Fizz. I would like to try Lip Butter – Pink Lemonade. I like the Lip Butter – Strawberry. I would really like to try the Island Fruits Moisture Fizz. all of their hand butters sound devine…I bet Hand Butter – Nectarina smells divine! The Calming all Over looks great! We’d love the Good Clean Fun – Dino Fizz Value Pack. I would love to try the Uplifting Body Moisture. All of the effervescent packs and bath soaks and the ginger candle. Good Clean Fun – Dino Bubbles.